Sadly this brewery has been forced to close its doors. Well it has happened! Abbotsford has now entered the Craft Beer revolution in British Columbia. Tim Brown a well known brewmaster who has brewed for both Mission Springs and Dead Frog Brewing has now started his own one man show Surlie Brewing. Just so you know this is an amazing likeness of Tim (if you didn’t know) and also the breweries Logo. This is a tiny little brewery and only has one employee until bottle day when friends are wrangled into part time jobs. I contacted Tim and was lucky enough to get the invite to take a peak at this new brewery and just chat for hours on all sorts of subjects. 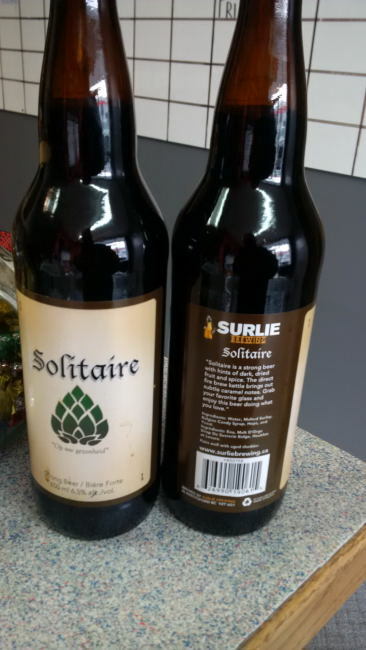 Surlie Brewing is launching with just one beer the “Solitaire” a Belgian Strong Dark Ale. A review will follow in the next few days but pick it up as soon as you find it and ask your local beer stores to bring it in! It only hit stores yesterday but is sure to be a local favourite. At this point Surlie Brewing will not have a tasting room or retail space as the City of Abbotsford will not yet allow this. I am sure this will change at some point as it was the same way in Chilliwack until recently. So depending on the City and Tim there may one day be a proper retail space. This entry was posted in Brewery and tagged abbotsford, bc, beer, canada, craft beer, solitaire, surlie brewing, tim brown.